Here are the table shots from the 2016 Southern NNL in Atlanta. Here’s some photos from the Southern NNL near Atlanta, Georgia this past weekend. GSL exists because of a desire to provide a professional setting for serious scale automotive builders to compete in a hospitable format where their efforts would be rewarded, where no one building style would be favored over another, and where the highest levels of the competitive spirit could co-exist with friendship, shared techniques and know-how, and where a respect for everyone’s work would prevail. Since 1979, GSL has hosted almost 620 different builders, all of whom come to GSL to compete in good spirts, and have shared their modeling techniques and learned from others, and enjoyed the life-long friends we’ve all made at the Championship. Newcomers are warmly welcomed, and often do exceptionally well in the competition – a small handful of first-time competitors in 2011 took home nearly a quarter of the total awards! GSL is an attitude – a mind set – about building that seeks and celebrates convivial and high-end building, shared ideas and techniques, a willingness to learn, and to commitment to constantly improving levels of craftsmanship, while competing for the prestige of winning. I hear it too often: “I don’t think I am ready to compete at GSL.” This remark comes from all sorts of builders who believe, mistakenly, that successfully competing at the Championship is reserved only for those who spend many hundreds of hours and dollars on their entry. While Best of Show winners do typically invest considerable time into their entries, placing in a Class isn’t an ancient art practiced by wizards, but merely requires a good “theme” for your entry, matched with thoughtful planning and meticulous construction, and attention to detail. We offer nineteen Classes that cover every possible automotive interest, from the typical Street Rod and Custom models through the more esoteric “If I Had Styled It” Class where the builder assumes the role of a design chief for a manufacturer and presents a styling study of what that specific manufacturer might/could have marketed in a specific year. We also offer other Classes such as this year’s Group 13 Class, where a designated model (this time, the AMT 1949 Ford Coupe) can be built in any style but using parts and materials that were available in 1978 or earlier, and the Common Kit Class (this time, the Monogram 1958 Thunderbird) where every competitor starts with the same kit, then builds it in whatever style he or she wishes. GSL Judging is an interesting process which is based on an evaluation of two key elements – balancing the effort undertaken by the builder mixed with an evaluation of how well the model was built – its craftsmanship. As you might expect, surgically-clean building is a requirement for successful competition. But, that isn’t all there is to it: GSL is also all about taking risks in the design and construction of a winning model: an exquisitely well-done model that takes no risk in detail or construction (for instance, just a model built straight from the box with only details added) won’t beat another model – equally well done – where the builder opened the doors and trunk, added full wiring, operational suspension and other “risky” construction elements. By similar analysis, a model that takes a lot of risks but isn’t built to high craftsmanship levels won’t prevail against a really well-rendered, detailed kit-based model. Wise builders take risks and then render their work to a very high craftsmanship standard. While the competition is the reason for the Championship, we also offer a lot of other activities for those in attendance. We open the event with a plenary session on Thursday morning followed by instructional seminars (on a wide array of topics) that run for the next two days, culminating with a presentation by the International Model Car Builders’ Museum on Friday night. A Trade Show is presented early Saturday morning, and tours of the Museum start Saturday at Noon and run through 4:00 p.m. The Contest Room is closed for Judging, and everyone reconvenes for breakfast on Sunday morning. We have a staff of 11 people that administer the event, handle registration, assist with the photography of models, administer the Trade Show and Seminars and the hundreds of other tasks required to run an event of this size and reputation. We’ll all wear “GSL Staff” badges – come up and talk with any of us about any questions, ideas, or concerns you have, or just to talk. GSL is nearly four days of intense competition, but it’s also about friendships – both renewed and new – attending seminars, learning more about the Museum, and participating in a Tradition that goes back to 1979. Typically, entrants from three foreign counties, and from 14 or so States are present. GSL is the longest-standing competitive event serving just the model car hobby, and there’s a convivial atmosphere where newcomers are welcomed as if they’d been competing here since the earliest years. If you’d like to learn more about the Championship, please visit our website at: http://www.gslchampionship.org/ If you’d like to view videos of historic seminars, or download one or all of the books and pamphlets were offer, without charge, visit the GSL Library Page found at http://www.gslchampionship.org/Library/library.html Of course, past attendees, and newcomers should all read the “Late Breaking News” page found at: www.gslchampionship.org/News/news.html as well as the entire site. 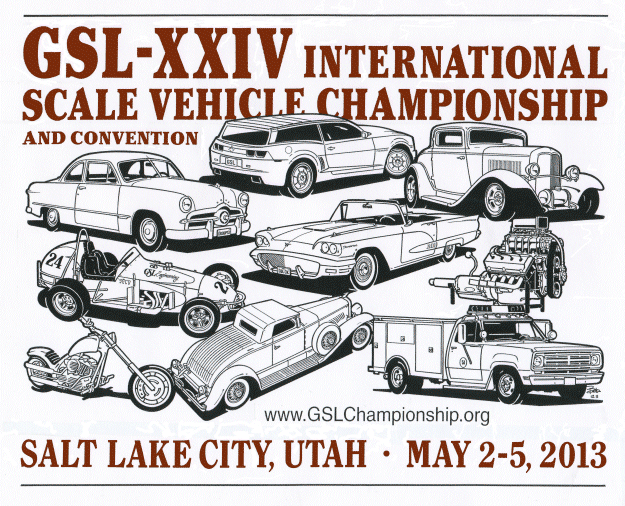 Please join us May 2-5, 2013 for the Twenty-Fourth GSL International Scale Vehicle Championship and Convention! We look forward to seeing you there! The GSL International Scale Vehicle Championship is indeed one of the most prestigious gatherings of automotive modelers on Earth. Builders from all over the world travel to or send their creations to Salt Lake City, Utah in order to compete with the best builders on the planet. Winning an award or simply placing in a class is a big deal and a worthy aspiration for all readers of Model Cars Magazine. But… what does it take to win an award or even take home a class win? A gentleman who accompanied me on the drive home after the 2003 show asked me this, and the question has nagged me enough to put this information together. You see, I have won a few class awards a couple of master’s awards at GSL including Best of Show in 1986. But even more important than that, I have also had the huge honor of being present while the judging takes place and overheard a tiny bit of the conversation that goes on during judging at every show since 1999. So I believe I just might have a unique viewpoint in order to suggest ways to make your models more competitive in 2009! ”…and they will come,” or so the saying goes. What this means to you is that if the model is cool, different, or unusual, then by word of mouth everyone in the contest hall will know about it. There are two reasons any car gets an award and the first is because it’s built cleanly, painted sharply, and detailed realistically. You might think that this is a no brainer but a lot of builders think that this is all that is needed. On the other hand, just because you took an award in a regional show does not mean your going to get anything at GSL. The guys who compete at GSL are the “best of the best” for a darned good reason! The second reason a car might receive an award is not so obvious, and that is because it is looked at by the judges and the people at the show. The judge’s eyes do not examine every car on the table! There is just not enough time to do that, and this is the sorry truth. However, by word of mouth your model will get looked at, judged and rated against the other cars on the table if it catches people’s eyes FIRST! Every time I have attended GSL, more than one person has approached me asking if I saw this car or that truck! If word has spread about a particular car, then you can be sure that the judges have heard about it as well. For example in 2001 Roger Yu entered a fantastic multimedia diorama that featured a Future Formula 1 Pit garage. From the very moment that Roger set it down on the table, word spread around the contest room and the expectation was that this was definitely in the running for Best of Show. You can be sure that the judges gave that one a good looking over. Best of Show winners in the past have come out of a wide range of classes registered at GSL, so there is really no “Sweet Spot” class where Best of Show is chosen. However the Street Rod class has been the host of seven Best of Show winners, and that is not something to be taken lightly! The Street Rod class is also one of the most hotly contested classes and the most populated of all classes at GSL contests since ‘79. This is also true to a lesser degree of the Custom class, generally because of the artistic license allowed in these classes. Free form creativity is the norm here and many of the very best model builders participate in Street Rod and Custom classes, so be warned if you plan to enter onto those hallowed grounds in ‘09! On the other hand, if you are looking for a relatively easy class win, then look to enter in something a little less populated like Motorcycle, Light Commercial or Replica Class. Other awards generally not concentrated on by other competitors are the Klingon Cruiser Award, the Ed Roth/Ricky Couch Memorial Award, or one of the group/common kit classes. Generally those awards are not so competitive and easier to attain if a builder puts his/her mind to it. Something to note is that the Light Commercial and Heavy Commercial classes have yet to host a Best of Show win. This seems strange to me due to the essentially higher level of details, possibility for scratch building and weathering possible on trucks found in these two classes. Maybe this will change in 2009? Well, not actually…but it should be sharp and brightly colored in order to be noticed, and getting noticed is half the battle, as I mentioned before. Only three Best of Show winners were painted red, by the way. A dark green Corvette with no graphics or a Lowrider in white pearl on the other hand, just might be overlooked by everyone in the room unless there is something there to grab the viewer. Remember you are competing against the other cars on the table so create something that looks “electric!” As far as paint quality goes, there are quite a few awards given for those builders who can paint well, and they are the Masters Award for Best Paint and the Model Cars Magazine award for Best Use of Color. There is also the Box Plus class where paint is about the only variable (other than clean building style) available to the builder, and Best in Class almost ALWAYS features a glass smooth paint job. Build something different and make it unique. A 1969 Camaro is going to get lost on the table when it is in a sea of other Camaros and muscle cars, regardless of the detailing and work that went into building it. I’m not saying that you shouldn’t build basic Camaros, Mustangs or whatever, but make it different somehow. Maybe you can do so by creating a long-lost variety, a show car, or a specialty vehicle not available in kit form. The Box Plus class is for “out of the box” models, so why build a nice car out of the box and only add just a few details like plug wires? All you are doing is moving your car into a more competitive class that will be populated by entries with waaaaayyyy more detailing. Thus the term “your outta your class, baby”! One way to get your car noticed is so obvious that many guys forget to do this, and that is to put your car on the edge of the table. YES, really! Not so close that it is in peril of falling off, of course, but close enough for everyone to see it, including those in wheel chairs. If the car is in the middle of the table, the viewer cannot get close enough to see all the little details you worked two winters to accomplish. Also a part of location is entering in multiple classes! Don’t limit yourself to just one class, as you may end up only competing against yourself. My suggestion is to spread it around and leave the lesser cars at home as they are only going to end up watering the class down and making it harder for the judges to see your best work! There are NO awards given for the most entries in one class by one builder! Also, connected with location, is the use of a display stand. A stand can contribute greatly to the wow factor, but it can also make it look gaudy or too flashy if done wrong. Rotating stands are nice, but there again the effect can be lost if the stand detracts from the model. Rule of thumb is a simple: stand it with a slight backdrop, and that will aid the realism and focus factor for the viewers’ eyes. Too big a stand and you’ll be moved to diorama. So fa,r no diorama has EVER won Best in Show, although Ken Hamilton’s “Home Sweet Home” came very close in ‘05! This arena was popularized by the late Dave Shuklis and starting with GSL – V (1984), became a master award for working scale features. Including, but not exclusive to: electric lights, opening doors/hood/trunk, roll down windows, working throttle linkage, door/hood/trunk latches, folding tops, etc. Mr. Shuklis was a fan of working features, and many builders have accomplished better and more realistically features since then, but Dave was the first and a true pioneer. Working features, if well done, can give your car a “class win” faster than a speeding bullet! Quite often I have heard the judges mention how fun it was playing with the door latches or watching how the hood popped open when the release was actuated. The Shuklis award itself is another one of those masters awards that is not usually sought after for some reason, and generally given to the vehicle with the most working features, regardless of the quality of everything else so keep it in mind. BUT, one should probably keep in mind correctly folding hinges, a way to keep the door/hood/panel closed, and the correct underpinnings once the panel is opened. In the case of car doors, the door jamb is generally uniquely shaped to the particular car you are replicating so get it right or don’t do it at all! You can also make the mistake that just because the convertible top folds down, that you’re going to win your class, but if the fabric doesn’t fold correctly or looks out of scale when down, then you have not improved the model and in some cases might have made it worse… My suggestion, if you have never done this before, is to start with something simple like a set of hood hinges. Nothing is more frustrating for a judge than to turn over a nicely built model in order to look at the underside only to have the hood FALL OFF because the builder failed to hinge it! Hinging a hood is the bare minimum any builder should consider before entering it in GSL competition! Opening doors on a small coupe can really add to the viewer’s pleasure by being able to see the hard work accomplished on a well-detailed interior, however, this is something that’s probably not necessary with a convertible, and can sometimes make such a car flimsy and delicate as well. Way back in 1986 we were instructed to only provide information on 3” x 5” cards unless it was entered in Factory Stock class. However, I have seen many entries of late complete with spiral notebooks documenting every tiny modification. And, amazingly the judges actually read through all that crap! I am not suggesting such overdone reference materials accompany every car, but a small place card suggesting where the judges should look and what changes or details you added to the model be the very minimum of documentation provided. Never assume that the judge(s) in this or any contest know intimately the base model kit you started with. If you built a Revell Big T kit, added valve cover gaskets, and made the shift linkage work, then you had better well tell them! Chances are the judges have not built that particular car, and may assume that these details were present in the first place. One thing nearly all the Best of Show winning cars during the last 28 years have in common is scratchbuilding. In most of the cases large amounts of parts, pieces and bits were created or formed from raw materials such as aluminum, wood, plastic, steel, and brass. Some of the cars featured cast metal parts, such as those built by Augie Hiscano or carved aluminum, like the engine in John MacGowan’s ’37 Woody. What began back in the ‘80s by replacing plastic rods with steel, and carving bodies built up from sheet plastic, or built up from wood has grown in scope and measure to 2005 when two of the top models built by Tom Kirn and Dave Cummings were completely constructed from scratch! They contained no kit pieces at all! A more reasonable approach to this craziness is demonstrated by the current Best of Show winner of Mark D. Jones where he simply replaced many of the kit pieces with beautifully carved, bent, and turned aluminum bits which vastly improved an already nicely detailed kit into one of the most extremely realistic model cars this author has ever seen! Of course, the fact that these three aforementioned models were larger scale should not go unnoticed. Many builders think that every wire, nut, and bolt needs to be added to win awards, but if you actually put everything possible in a scale representation of your actual 1:1 ride then more than half the wires and such would be missed by the eye. Think of it this way, a detail clearly visiable at one foot may totally disappear if seen at 25 feet. A modeler only needs to give the illusion that everything is present. Take an alternator for instance. Most alternators have two wires running into the wiring loom. If the accessory is highly visible by being mounted high in the engine compartment, then the wiring should be added. But if the alternator is located low, maybe even under the air-conditioning compressor, then the builder can most likely leave it out. Only once have I heard of two cars being sooooo close in detailing and build quality that the judges gave one the nod just because firing order of the sparkplugs was correct. That is super rare and the fact that the judges knew the correct firing order I figure is a 1 in 1000 chance. Most likely, a modeler who makes the spark plug wires simply LOOK like they are in the right order is enough. Does it look real or cartoon like? Realism is, of course, in the eye of the beholder. What looks real to you is based on your point of reference and may not be so to someone else, but since we are trying to build a winner at GSL, then your subject has got to be realistic enough to the judges eye to be believable. Of course the realism ranges widely depending upon which class the model is entered, so keeping the subject within the real world is always a good idea. Fantasy models are cool, but generally do better at IPMS contests. If you are building a custom, then keep it in the general parameters of the custom world or else you might end up with the Klingon Cruiser Award (not such a bad thing after all). If you are building a street rod then try not mixing your “metaphors,” which is a metaphor for don’t put nostalgic wire wheels on a car that features an engine capable of generating 500 hp! If you are building a race car then be sure that it contains all the safety equipment required for the period the car was raced. You can be sure that if you don’t, all things being equal with the car next to it, the judges will call in a racing expert. So be warned.